Reports suggest that Sadhvi Pragya's candidature from Bhopal might be announced by evening. 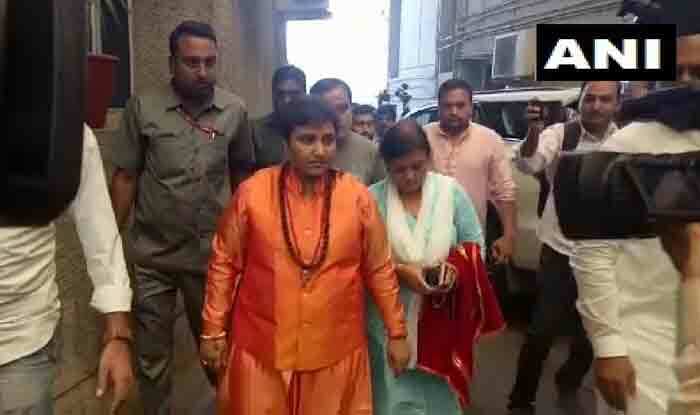 Bhopal: Sadhvi Pragya Thakur has formally joined BJP and is all set to represent the party in these Lok Sabha elections and win. “I have formally joined BJP, I will contest elections and will win also. I was extended party membership on Tuesday,” she said. Reports suggest her candidature might be announced by evening. Zee News had reported that the saffron party planned to field Sadhvi Pragya against senior Congress leader Digvijaya Singh from Bhopal in Madhya Pradesh. Talking to the channel, Sadhvi Pragya had said that she was ready to fight from wherever the party deemed fit. She claimed that Singh wasn’t even a challenge for her because she was, unlike the Congress leader. Bhopal seat has been with the BJP since 1989. In 2014, party candidate Alok Sanjar of BJP with a margin of 3.7 lakh votes. But Congress’ decision to field Digvijaya Singh has forced the BJP to come up with a leader who can match up. In last year’s Assembly poll, Congress had won three out of eight Assembly segments of Bhopal Lok Sabha constituency, while the BJP had emerged victorious on five seats. The Bhopal Lok Sabha constituency covers Berasia, Bhopal Uttar, Narela, Bhopal south-west, Bhopal central, Govindpura, Huzur and Sehore.